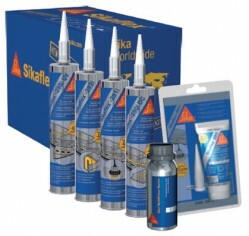 Sika’s adhesives and sealants are working materials which show good affinity for other surfaces. Their task is to flow as a liquid onto and into the contours of a surface and then transform themselves into a solid, by developing both a physical and a chemical bond with the substrate. Sika Marine adhesive and sealant systems range from fluid liquids to heavy, viscous paste like materials, able to supply low-to-high strength values and cure to a highly elastic or rigid bond. The ability of the adhesive or sealant to “wet” a surface is very critical in development of a proper bond; solidification (curing) can take place through a physical or a chemical reaction, or through both at the same time. Experience has shown that chemically reactive adhesives like Sikaflex® have the highest strength, durability and resistance to water.